Today I’d like to talk a little about box inserts. Some games come with amazing box inserts, and some are basically … just a box. Besides pretty much all the games of Fantasy Flight Games, Agricola also is a perfect example of a game with the complete absence of an insert. I really applaud games like Seasons, Mysterium and Pandemic in the Lab for their box inserts, they’re very practical and look amazing. We’ve been buying little boxes for some games and I came to the discovery that boxes holding nails, hooks and screws are sometimes ideal for keeping game tokens organised. The boxes are small and have a lot of compartments. As a result we now have enough nails and hooks to hang everything. For the rest of our lives, probably. I prefer the already empty hobby organiser boxes of course, but with Elder Sign I just spotted this perfect tiny box for all the tokens. Which game has the best box insert and which game has the worst, according to you? I use Really Useful Boxes for 90% of my gaming needs. http://www.reallyusefulproducts.co.uk/usa/ They’re tough, they secure tightly, and they come in tons of sizes. There are some nice box inserts which show that people really thought about it. 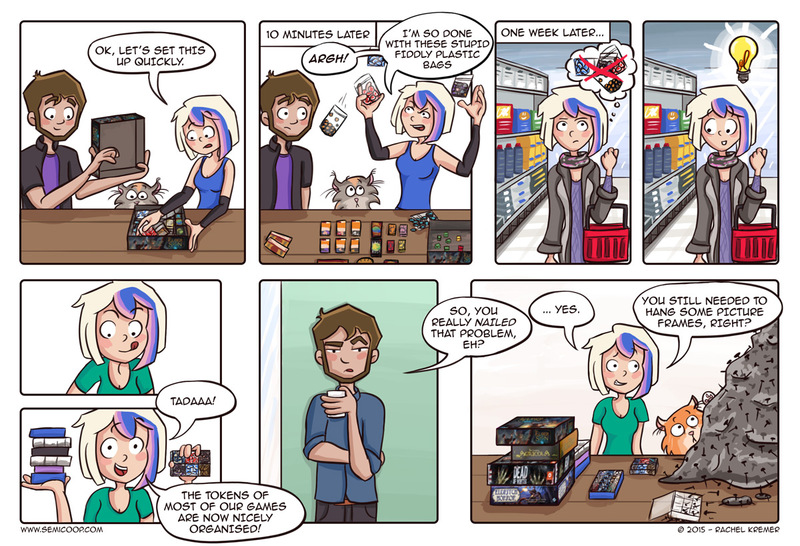 Splendor, Lords of Waterdeep are good examples. And yet all good intentions go to waste, apparently nobody considers the possibility that games would be transported. So the ‘perfect’ insert doesn’t exist without a system that prevents the lid to become loose of the box and thus creating (enough) space for parts to move. Those foam inserts look amazing! I love having my things all tidy and stuff, but most of all, my netrunner tokens are always perfectly tidy in small enough boxes, so that they fit in the Netrunner box with the decks as well. Easy to get out and set up right away! Step 3: take the decks out and the IDs that are in hard plastic containers at the bottom of the box. And that’s how I roll from tournament to tournament! In Australia, we have a big hardware store called Bunnings that supplies boxes of all shapes and sizes for tradesmen to put nails etc in. We have probably together bought more than the local trademen from them. We’ve basically moved all of our cards (Netrunner, Conquest, etc) into the larger ones, Armada models into the larger ones, XWing models into the medium ones, and tokens into the smaller ones. Verrry similar to that clear one you have up top in your picture. And the orange and black one you have up there looks just like the one some of the others use for their medium XWing models. Lords of Waterdeep is probably my favourite for box inserts. Except for trying to get all the gold tokens into the vacuform plastic (seriously, why does one always not fit? ), the little cups used for the cubes are absolutely amazing for scooping a bunch out. I bought some fishing tackle boxes on discount. Some have rearrangeable compartments and some are just perfect the way they are (I have two which fit ALL of my X-wing tokens, stuff and even the models). Worth keeping an eye out online for discount sales or stock sales at the local tackle store. Even flea markets are a perfect place to find them! if i have a gox what needs reworking and i would like to have a nice box, i can make it myself. i can dising a box thats then cut outh by a lazer printer. i even have made some inserts for this purpos. i was even experimenting with fome core but i have to sa its a weard meterial. lazer printing is easyer. dising 1 time. re-use desing a lot of times. i desing the stuf as a hobby and have made presents for my frends that way. lukely enough i have the opportunity to work with a lazer. evrybody can if they want to though Fablab (organisation) makse 3D printers and Lazers available for the general public. i have been using the one in Enschede for a few of my own projects. We use tackle boxes for serveral of our games (although we buy empty ones, not ones filled with fishing equipment). The ones we have for Star Craft are the perfect size, six fit exactly into the SC box with room for the cards etc. on top. Don’t mind me commenting several months late, I’m just reading through your archives. What’s more, it’s a tile placement game, so grab an action sheet, your two action tokens, shuffle and deal the cards, place the central pond hex (which you would have placed on top of the other hexes after the last game, of course) … and you’re ready to go! Everything else comes into play as you go. Putting it away takes a little longer, but that’s preferable to a longer setup, yeah? 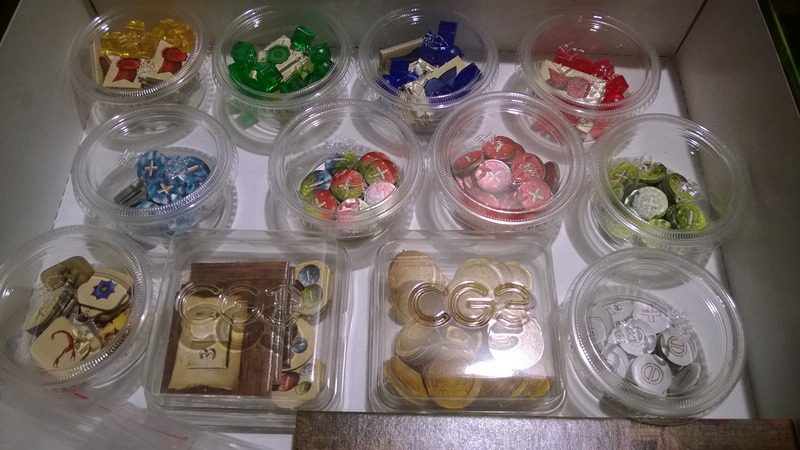 Lords of Xidit … could REALLY benefit from one … right now, the box bulges with an overload of fiddly, plastic bags. I recently got into Foam Core building. this is a fantastic way to cheaply organize your board games. Reddit has a fantastic community about this, it is very cheap to get into, you need a ruler, T square, Some sheets of foamcore and a good quality knife ( use an Olfa retractable that has cheap replacement blades) and some glue and pins, all in cost me like 20$ to get started! Sushi Go Party! Dutch Edition has an absurd box! The box is way too big for its contents (a tiny board, cards and some pawns) and has no insert. So apparently they expect you to just throw all the cards in there after play. I bought sealbags, but they are annoying because you always play with a subset of the cards so there is a lot of sorting and searching. A good insert would have helped a lot!